We are excited to have joined the ranks of many other member businesses who seek to promote and create economic growth and opportunity within the Stoneham community. Provia Laboratories, LLC, a health services company specializing in high quality biobanking is pleased to announce that the company has joined the Stoneham Chamber of Commerce in Massachusetts. “We are excited to have joined the ranks of many other member businesses who seek to promote and create economic growth and opportunity within the Stoneham community. Headquartered in Lexington, our company is looking forward to networking opportunities and building close relationships with our neighbors in Stoneham,” says Howard Greenman, CEO of Provia. Provia Labs provides a service called Store-A-Tooth™, which preserves stem cells found in teeth whether they are from baby teeth that are naturally falling out, teeth removed for orthodontia, or wisdom tooth extractions. Similar to stem cells from bone marrow and umbilical cord blood, stem cells from teeth have the potential to be used in a broad range of medical applications and have already been shown to successfully regenerate dental bone and treat periodontal disease. Backed by their extensive dental provider network and their continuous involvement within many different communities, Provia exhibited their Store-A-Tooth service at the Stoneham Health & Wellness Expo this past Saturday, May 4th, amongst a crowd of more than 1,000 attendees. Merrimack Valley Oral Surgery in Stoneham, a Store-A-Tooth provider, has tapped into the potential of regenerative medicine and is “dedicated to delivering an improved health and appearance through education, treatment, and friendly service in a comfortable environment." They exhibited alongside Diane Bonanni DMD, a Stoneham family dentist and Commerce board member who offers the Store-A-Tooth service to her patients. Provia Laboratories, LLC (http://www.provialabs.com) is a health services company specializing in high quality biobanking (the collection, transport, processing, and cryogenic storage of biological specimens). 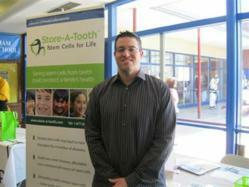 Its dental stem cell banking service, Store-A-Tooth™, gives families the option to store stem cells today to protect their children’s future health, so parents can take advantage of advances in stem cell therapies that someday may help treat conditions such as type 1 diabetes, spinal cord injury, heart attack, stroke, and neurological disorders like Parkinson’s and Alzheimer’s. For more information about Store-A-Tooth™ dental stem cell banking, please call 1-877-867-5753 or visit http://www.store-a-tooth.com. For more information about Dianne Bonanni DMD and her Stoneham dental practice, please call 781-438-7900 or visit http://www.stonehamcosmeticdentist.com.